Like everything in life, timing your hunt for Sika deer doe is important and will impact on the quality of animal you can expect to bring down. There are considerations from when the animals are in the best shape. 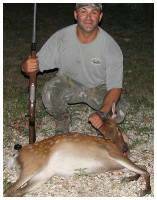 Of course timing your hunt for the ever challenging Sika deer does can also help you get in shape for whitetail deer season as well other species that may also have very strict seasonal hunts. 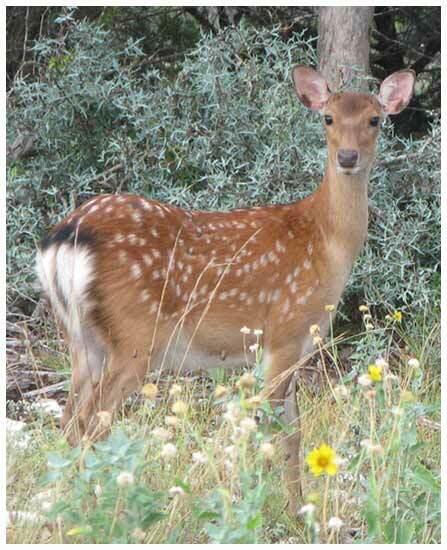 The first thing to keep in mind is that Sika deer doe and Sika buck are considered exotic species in the state of Texas. This is a great benefit to hunters since there is no state regulated hunting season. Sika does and bucks can be hunted year round, but there is a definite advantage to doe hunting over buck hunting any time of the year. 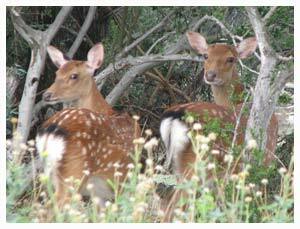 Sika deer bucks, like whitetail deer a native Texas species actually shed their antlers in the spring. Since the does aren't hunted for their antlers you can literally plan a hunt at any time without worrying about the shape and size of the antlers. The does also tend to stay more uniform in weight throughout the year without the dramatic fluctuations often seen in the bucks especially before and during the rut. Late summer and early fall hunts for Sika does are a great option since the Texas weather is more likely to be cooperative and sunny than during later fall and winter hunts. While it may rain, significant rains are not common in the late summer and early fall, meaning you don't have to be overly concerned about weather complications during your time at Escondido Ranch. Hunting Sika does in late summer and early fall also has other advantages. You have time to get back into shape before the pressure of the whitetail deer season hits you. Since there is no season, you can easily book a weekend or week or two of hunting at your convenience to get your gun sighted in as well as your hunting skills honed. Hunting Sika buck and Sika does prior to the opening of whitetail season allows the hunter to pursue Sika deer before they get too cautious. Sika does and trophy Sika bucks offer a lot of challenges for the hunter. Even thought they may be used to eating at feeders and comfortable with the blinds being on location, Sika deer are by nature very cautious and intelligent animals. Combining their natural ability to detect changes in the environment as well as their habit of staying just inside the edge of cover until they have determined all is safe makes these deer a sporting hunt. This doesn't even take into consideration their coloration of dark chocolate to light tan through to darker black that seems to give them the ability to blend into the Texas vegetation, requiring even more skill of the hunter. Sika deer does are a great meat animal and their hides are wonderful for tanning and using as a display. The heads can also be mounted for a wonderful exotic addition to your trophy wall, making Sika doe hunting a must for all sportsmen and women.